I love paddling in the Fall. 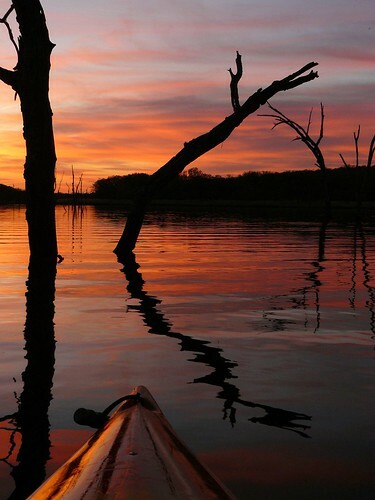 The weather gets pretty unpredictable in Oklahoma, but you can expect some days nice enough for kayaking. All that changing weather adds to the sunsets, so make sure you don't go home before the show is over! Paddlesports Retailer, the official tradeshow for paddlers, by paddlers, will move to Oklahoma City in 2018. The new location was chosen for its commitment to creating a spectacular, world-class urban paddlesports venue on the Oklahoma River. "There are two primary reasons that we're moving to Oklahoma City," says Show Manager Marcus Shoffner. "First, we are simply out of space in Madison. We were overwhelmed by the response from both retailers and vendors at our inaugural show. Oklahoma City gives us room to expand with a new 200,000 square foot convention center slated to open in 2020. But most importantly, Oklahoma City offers the country's premier paddlesports venue which will be the centerpiece of our event." Over the last 10 years, Oklahoma City has invested more than $100 million in the Oklahoma City Boathouse District, the official U.S. Olympic Committee (USOC) Training Site for paddlesports. It includes a world-championship caliber sprint kayak and rowing course, a $45 million Olympic whitewater river and slalom course, and a high-performance training center for elite paddlesports athletes from around the world.